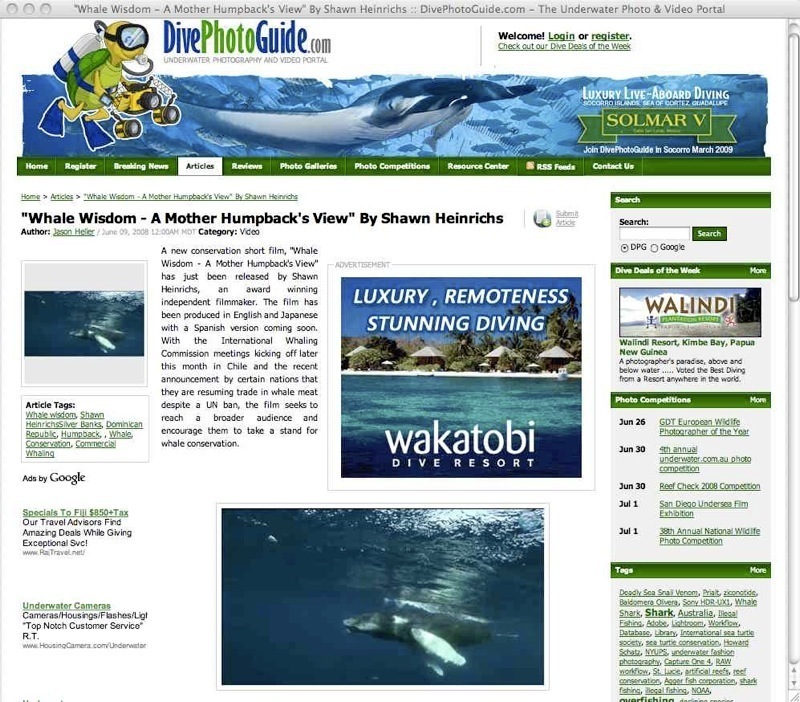 A new conservation short film, “Whale Wisdom – a Mother Humpback’s View” has just been released by Shawn Heinrichs, an award winning independent filmmaker. The film has been produced in English and Japanese with a Spanish version coming soon. With the International Whaling Commission meetings kicking off later this month in Chile and the recent announcement by certain nations that they are resuming trade in whale meat despite a UN ban, the film seeks to reach a broader audience and encourage them to take a stand for whale conservation. 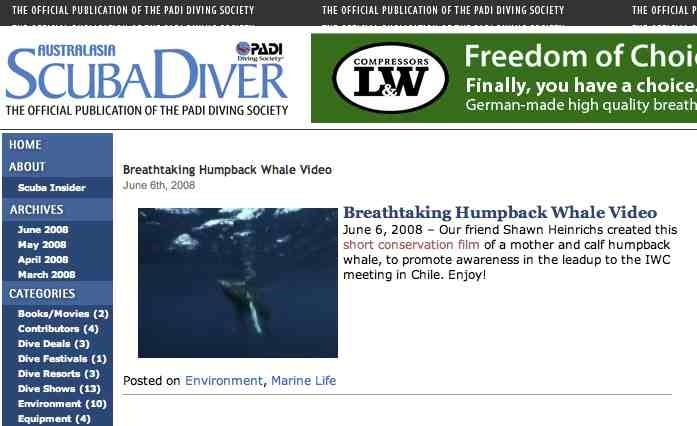 Australasia Scuba Diver features the latest conservation film by Shawn Heinrichs. “Whale Wisdom – Mother Humpback’s View” opens with a mother humpback whale resting below while her calf ascends to the surface and explores the wonders of this strange new world. She offers her calf encouragement and assurance, but also warns of dangers to come. She recalls how commercial whaling all but wiped out many whale species and how even now, over 20 years since the ban on commercial whaling, the killing continues. In her parting thoughts she worries if this year they will take her only child. Over the past century most whale species have been hunted to the brink of extinction. Commercial whaling was banned by the International Whaling Commission in 1986 yet over 25,000 whales have been hunted since then. With nations such as Japan, Norway and Iceland pushing for the legal resumption of commercial whaling, the situation is critical. In March of 2008 I lead a charter group to the Sliver Bank of the Dominican Republic. In the months of January to April each year, humpback whales gather in the thousands to give birth to their young and mate. In all directions whales are breaching, tale slapping and diving. Below the surface, mother humpbacks care for their young calves. Words cannot describe the magic of these encounters. While the mother whale rests below, the calf will rise to the surface to breath, frolic and explore its world. We the guests become babysitters if we are careful enough to earn the mothers trust. The footage from these encounters captured some of this magic. From this, the concept for “Whale Wisdom – a Mother Humpback’s View” was born. The goal was to step back from the political and racial debates that rage on about whaling and simply present the whales view on the issue. The trip was a great success, leaving a lasting impression on all the guest and creating a foundation for my conservation film.